Happy Hanukkah to everyone celebrating in Australia and around the world from the Lamattina family! 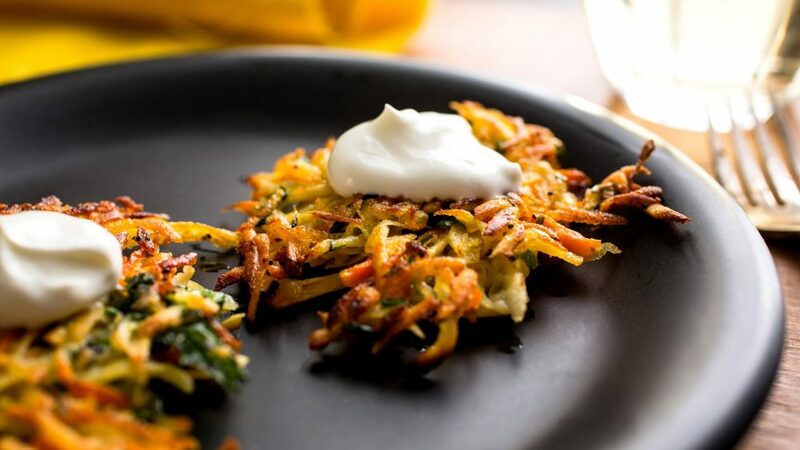 Here’s a delicious spicy carrot, potato, and parsnip latke recipe from the New York Times, for something a little different. Of course there’s no one perfect way to make latkes, or even a recommended serving time. Some people love them as a starter, or as finger food, or even as a side dish. 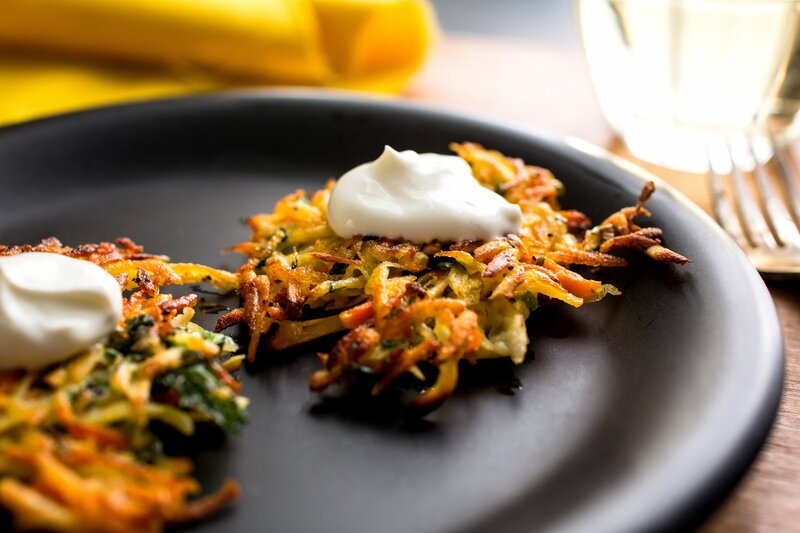 Indian flavours in this particular spin on latke by Martha Shulman put some zing and spice into this delicious Hanukkah classic. According to the Atlantic, the original latkes weren’t potato-based at all, but effectively “deep fried ricotta”. Either way, potato or cheese, the pancakes are delicious, crispy, and a serious treat for your family. Parsnips also have a nutritious bonus on top of their creamy, sweet texture. Happy eating! Preheat the oven to 300 degrees. Place a rack over a sheet pan. In a large bowl mix together the carrots and parsnips, potatoes, baking powder, salt and pepper, chiles, cilantro, nigella seeds, chives, and flour or cornstarch. Add the eggs and stir together. Begin heating a large heavy skillet over medium-high heat. Add 2 to 3 tablespoons of the oil and when it is hot, take up heaped tablespoons of the latke mixture, press the mixture against the spoon to extract liquid (or squeeze in your hands), and place in the pan. Press down with the back of the spatula to flatten. Repeat with more spoonfuls, being careful not to crowd the pan. In my 10-inch pan I can cook 4 at a time without crowding; my 12-inch pan will accommodate 5. Cook on one side until golden brown, about 3 minutes. Slide the spatula underneath and flip the latkes over. Cook on the other side until golden brown, another 2 to 3 minutes. Transfer to the rack set over a baking sheet and place in the oven to keep warm. The mixture will continue to release liquid, which will accumulate in the bottom of the bowl. Stir from time to time, and remember to squeeze the heaped tablespoons of the mix before you add them to the pan. Serve hot topped with low-fat sour cream, Greek yogurt or crème fraiche, or other toppings of your choice such as salsa, chutney or yogurt blended with cilantro, mint, and garlic.